Mr. Anton Balasingham, political advisor to the Liberation Tigers, left Kilinochchi Friday morning after concluding extensive consultations with Mr. Velupillai Pirapaharan and senior officials of the LTTE regarding the resumption and continuation of peace talks with the Government of Sri Lanka. 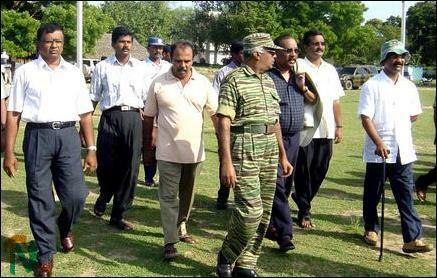 He will leave for London Friday evening, LTTE officials in Kilinochchi said. 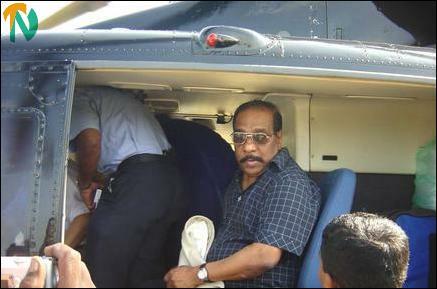 Senior LTTE military commanders and Mr. S. P Thamilchelvan, the head of the Tigers’ political division accompanied Mr. Balasingham to the Kilinochchi grounds where he boarded a Sri Lankan Air force helicopter to Colombo. “His stay in the Vanni though brief was very fruitful. His presence greatly facilitated the preparations for laying the ground work for resuming talks with Colombo”, an LTTE official said.